Brennan disclosed Saturday that Obama opposed a plan to carry out "a cyber event" against the Russians because the former president feared the action would lead to more aggressive interference by Moscow. "There was consideration about rattling their cages with some type of cyber event," Brennan said during remarks to a journalism conference at the University of California Berkeley. But based on Obama's fears, the planned cyber action was shelved in favor issuing vague warnings to Russian officials. Brennan did not elaborate on the cyber retaliation plan. "President Obama was the ultimate decision-maker on that," Brennan said of the lack of response. The former CIA director defended the Obama administration's handling of what is widely viewed as a significant counterintelligence failure during the presidential election. After the election, Obama ordered the expulsion of 35 Russian intelligence officers. Both the FBI and CIA are charged with the conducting counterintelligence–detecting and thwarting hostile intelligence operations. Both agencies failed to halt the Russians in 2016 either in the United States or abroad. U.S. officials have said the targeting of U.S. and foreign elections by Russia is continuing. President Trump in February criticized his predecessor in a Tweet for failing to act. "Why didn't Obama do something about the meddling? Why aren't Dem crimes under investigation? Ask Jeff Sessions!" he tweeted. The disclosure that Obama scrapped a cyber plan to retaliate against Moscow for election interference comes as a former senior counterintelligence official, Michelle Van Cleave, revealed in congressional testimony last week that the Obama administration weakened American counterintelligence programs by downgrading a top counterspy office. Brennan said he had "great confidence" the Russian influence operation was authorized and directed by Russian President Vladimir Putin, a former KGB intelligence officer. The Russian intelligence services also "know what the mission is, know what their capabilities are, and will apply them to issues that are of interest to Russian national security," he said. Brennan called the meddling "unprecedented in terms of its scope and intensity, and made full use of the digital domain." The first indications of Russian interference were spotted in late 2015 and early 2016 and the operation was mentioned in press reports in the spring of 2016. By the summer of 2016 the operations were confirmed, he said. Obama also made clear to the CIA that he did not want the agency doing anything "in reality or in perception" that would have advanced the Russian disinformation and propaganda campaign, Brennan said. "We were really trying to strike the right balance between doing everything we could to prevent and thwart as well as to uncover and understand what the Russians were doing without doing anything that would almost advance their interests in trying to disrupt our election," he said. Obama also was afraid any U.S. action against the Russians might be perceived as an outgoing Democratic president working to influence the election outcome. "So if we did more things and stood at the hilltops and cried out, ‘the Russians, the Russians are trying to help Trump get elected,' and if President Obama who is the titular head of the Democratic Party were to do that, I think that there would have been a lot of people would believe, I think with some justification, that the President of the United States was trying to influence the outcome of a presidential election," Brennan said. Brennan also said the Obama administration opposed aggressive action because of the president's belief that any effort to punish the Russian might produce stepped up activities. Russian hackers had been detected navigating inside state election voter registration roll computers and other election-related networks. "They had things that they could have done that they didn't do," Brennan said of the Russians. Intelligence agencies concluded in a report issued in early 2017 that Russian civilian and military intelligence agencies conducted an aggressive operation to sow social discord during the 2016 election by opposing Hillary Clinton while seeking to boost Donald Trump's campaign. The Russian operation included the use of advertising on social media platforms like Facebook, and cyber attacks involving the cyber theft of emails and postings online using covert internet personas. In February, 13 Russians were indicted by Special Counsel Robert Mueller for running a St. Petersburg, Russia-based internet troll farm that carried out influence operations during the elections. So far, no action has been taken against the Russian hackers engaged in email thefts. Kenneth deGraffenreid, former deputy national counterintelligence executive, said Obama's inaction was a major counterintelligence failure. "If Brennan’s claims are true, the Obama administration’s inaction in the face of this Russian cyber aggression represents a serious counterintelligence failure that has had terrible consequences," deGraffenreid said. "Good counterintelligence requires an active element beyond collecting and analyzing the secret information that has been uncovered–namely countering this serious foreign intelligence threat in an effective way. The U.S. has the sophisticated tools to do this." "There simply is no excuse for not doing so," he added. "Our national security depends on American leaders taking the action required." Despite signs the operation had been underway since 2015, Brennan said he was the first U.S. official to protest the matter during an Aug. 4, 2016, telephone to Alexander Bortnikov, head of Russia's FSB security service. "I told him rather directly that if the Russians were to go down this road, they would pay a significant price," Brennan said. "I told him that all Americans would be outraged by a Russian effort to try and interfere in our election." A month later at the G-20 summit in China, Obama confronted Putin about the election interference, according to Brennan. Weeks later, Director of National Intelligence James Clapper and Homeland Security Secretary Jeh Johnson issued an official statement accusing the Russian government of interfering with the election campaign. Brennan said he believes the softline Obama policy dissuaded Moscow from intensifying the campaign and that he had no regrets. Additionally, the former CIA chief said he has spoken to Obama who he asserted is "very comfortable with what we did and didn't do." "I would argue that I think by pushing them back a bit and confronting them with it, both privately as well as publicly, I think we did dissuade them from even going further," he said. 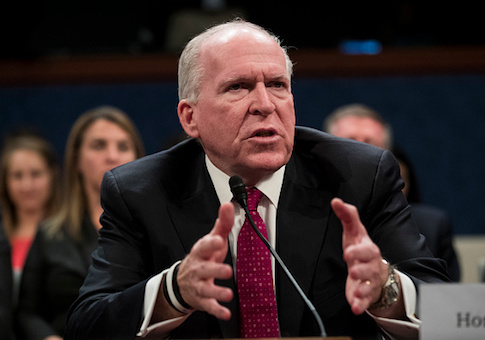 Brennan also said the CIA was told by Obama not to take any action on the Russian intelligence operation over concerns any action would appear the administration was trying to support the Democratic candidate, Hillary Clinton. Since leaving office, Brennan has been a Trump critic, taking to Twitter to call the president a "charlatan," "demagogue," and "snake oil salesman." Brennan said that criticism has cost him financially as "a number of opportunities were rescinded." Russian cyber intelligence operations are sophisticated and difficult to track, he said. "And so I fully anticipate that the Russians and others are going to take advantages that are there," Brennan said. "They are going to try to hide their footprints better. They're going to try to prevent the U.S. from understanding what may be happening there. But let's not make a mistake, that environment is ripe for mal actors and they are going to continue to cause us problems." On the controversial dossier produced by former British intelligence officer Christopher Steele, Brennan said the dossier may have been part of a Russian cover operation. "Well certainly it could be," he said. "I don't know the provenance of the information. As I said I've seen the dossier. It is done by a former accomplished member of the British intelligence service, MI-6. It is sourced to unnamed sources and subsources that alleged these types of activities. So I don't know whether the information in it–some, all or none–is valid or not." Brennan said he does not believe Steele was manipulated by the Russians for intelligence purposes. "I do not believe he is acting on behalf of them," he said. "Might he have been unwittingly used? Maybe. So I don't know." The Steele dossier was funded by the Democratic National Committee and the Clinton campaign through the research group Fusion GPS. The Washington Free Beacon hired Fusion GPS to conduct research on Republican candidates but had no role in the dossier. On his political views, Brennan said he is not a member of any political party and described himself as "an avowed nonpartisan." In 2016, Brennan disclosed that in 1976 he voted for the Moscow-backed Communist Party USA candidate for president, Gus Hall, during the height of the Cold War. This entry was posted in National Security and tagged John Brennan, Russia. Bookmark the permalink.